Relationships can be difficult, and they require commitment. A commitment to another person means a commitment to put in the effort. 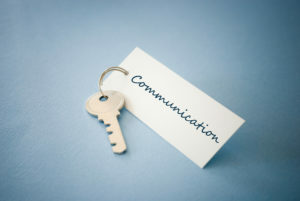 Regardless of the type of relationship, whether it is a husband, wife, girlfriend, boyfriend, best friend, family member, etc., good communication is key in a relationship. Two large faults that we make as humans is forgetting that not everyone thinks like we do, and that people can’t read our minds. Remember that we each are different and unique, while you might be sensitive to some things, the other person may not be, and vice versa. Proper communication has to come from both ends, and that means explaining to someone how you feel and why, as well as listening to how they feel and why. A very common mistake made in communication attempts is forgetting to truly listen to what the other person is saying, don’t spend the time that they are talking, thinking about what you are going to say next but rather by actually listening. Remember, it’s a two-way street and you both must be putting in the effort. Many times, communication goes wrong because both people aren’t implementing proper communicative tactics. Give the other person a break from trying to pick up on your hints or body language and rather explain and break down to them how you are feeling and why. To avoid misunderstandings, opt to communicate things than assuming they already know. You also must remember that holding stuff in is never the answer. Although you may think keeping it in will help, if it does, it is a very temporary fix as things that are swept under the rug more often than not come back even scarier and bigger as resentment. When you speak to the other person, don’t let your emotions control your words or the tone of your voice, but rather use that emotion to help the other person understand. For example, if the other person did something to make you really angry, don’t respond in anger but rather start the sentence explaining to them your feelings, “when you did this, it made me feel hurt because…” People respond much more efficiently to feelings of hurt than anger, and often anger is just an emotion that covers up other types of feelings and emotions like sadness, insecurity, betrayal, jealousy, etc. Remember to also avoid using accusatory language in conversation, such as, “you are this,” or “you did that,”, this will quickly lead someone to jump to the defense and you won’t get anywhere in your attempt to communicate. And don’t forget one of the most important parts of communication, listening. If you find these tips still aren’t working for you, there is another option. A third party may be able to help you, which is why so many people are turning to relationship therapy in Carrolton. Sometimes a mediator can really open your minds to understanding the other and how they best communicate. Your body says a lot to another person without you even having to speak. Make sure to be conscious and aware of your posture, facial expressions, and tone of voice while you are trying to communicate to one another. Often your facial expressions and posture and tone can allude anger which, regardless of your words, can put the other person on the defense. Communication is so important for a healthy relationship. If you do your best to always communicate to the other person, you will rid the opportunity for misunderstandings to arise, and misunderstandings often lead to quarrels. Sometimes a good conversation can completely change the dynamic of a relationship. Make sure you practice these good communication skills and tell your friend, spouse, or family member about them too, so you can practice them together. If you are having trouble implementing these communication skills properly in your relationship, you may want to come in for relationship counseling in Carrolton. Here at Lifeworks, we want to help. We are trusted team of communication experts that are eager to help you and your loved ones live a happy and healthy life. If you have any questions or would like to schedule an appointment, don’t hesitate to contact us today.